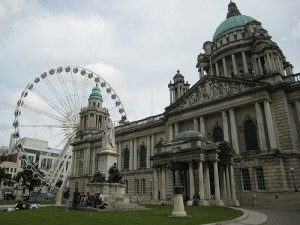 I used to live in Belfast a couple of years back and can recommend it as a fantastic city with lovely people in it. It is also the place that helped me rediscover the joy of driving. You see, I had lived in London for a while before that and commuting to work meant plunging into a subterranean world of semi darkness and strange wind systems. Yes, the underground might have a lot of supporters but I am not one of them. Sitting awkwardly, pretending to read the newspaper and avoiding any sort of eye contact with potential weirdoes is something I prefer leaving for the family get-togethers at Christmas time. Are You Off to Carrickfergus Today Love? Then I got a new job in Belfast which meant going out to people’s houses to sell them life insurance. I am sorry but someone has to do it. This meant that I got sent a big batch of names and addresses each week and had to visit potential victims, I mean clients, from Larne to Bangor and from Carrickergus to other places whose names I can’t remember now. The pleasure of jumping in my hire car and heading off to towns I had never been to before was amazing and I started genuinely looking forward to my days at work. I even sold an insurance policy occasionally. I know this might sound terrible politically incorrect but wouldn’t you prefer to ditch the bus, the tube or the bike and start driving again? You might not be as lucky as me and get to drive all day in a different country but maybe you could get together with some friends and take turns in using your cars to make the daily trip to work . You might realise that you have been depriving yourself of one of the great joys of life for too long. This entry was posted in Musings, News and Views and tagged Belfast, car, insurance policy, Ireland, London, LS, MoT by Robert Bell. Bookmark the permalink.